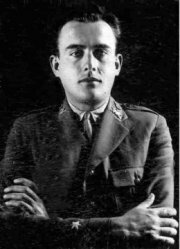 On this date in 1936, Spanish aviator Virgilio Leret Ruiz was shot for resisting the fascists’ opening gambit in what would become the Spanish Civil War. Leret (Spanish link, as are all the ensuing links in this post), who has the incidental distinction of having patented an early jet engine design, was, circa 1936, stationed at the Atalayon Seaplane Base on the outskirts of Spain’s Moroccan exclave of Melilla. This would put him in the front row for the very first action of the terrible civil war — the July 17 military uprising (Spanish link) that secured Spanish Morocco for the putschists within hours. North Africa, correctly rated as easy pickings, was to be the first target of Franco’s rising, with the main event on the Iberian peninsula following the very next day. From their standpoint, it pretty much went off without a hitch. 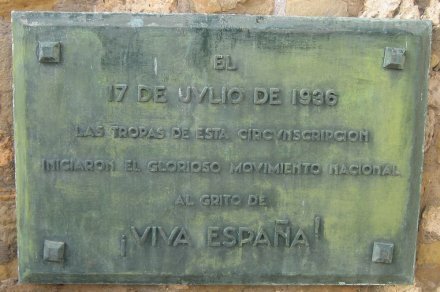 This pro-Franco plaque in Melilla celebrates the city’s distinction as the place where his “glorious national movement” was launched. Image (c) Joshua Benton and used with permission. Leret’s wife Carlota, spent 4+ years locked up and wrote this book about her fellow prisoners. She later moved to Venezuela, where Leret progeny still remain. Despite the absence of any effective resistance elsewhere in Melilla, Captain Leret scrambled from a relaxing day swimming with his family and commanded his base to hold out for the Republican government. While it was no real threat to the rebelling officers, the gesture required a slight detour by Franco’s forces, and even a couple of casualties before the Seaplane base surrendered that night to obviously overwhelming opposition. The next day at dawn, “half-naked and with a broken arm,” Virgilio Leret Ruiz became — along with two ensigns under his command, Armando Corral Gonzalez and Luis Calvo Calavia — the first people executed in the Spanish Civil War. Needless to say, a great many others would follow them. A 2011 documentary, Virgilio Leret, the Blue Knight, retrieves the reputation of this “exceptional man”, and the experience of 20th century Spain through the fate of his family.